Let’s talk about newborn photography safety, and as a parent what questions you can ask a potential photographer before booking your newborn session. Congratulations on your pregnancy! Undoubtedly you are entrenched in a multitude of options and decisions for your precious little bundle. You’ve likely spent hours researching and reading reviews about which baby monitor to purchase/which car seat to buy/cloth vs. disposable diapers and so on. But when it comes to selecting a newborn photographer in Arizona to document your sweet little babe’s first portraits, do you know what to look for? Choosing a newborn photographer is just another item to add to your list, but luckily it is an easy one, right? Well, not exactly! We have a great photography community in Arizona, with many amazing options for newborn photographers all over the Valley. It is easy to become overwhelmed with options, and focus on a pretty gallery, price or product as the differentiating factor. However, there are many factors and questions you should be examining when seeking a professional to document your baby’s newborn photography session in Arizona. 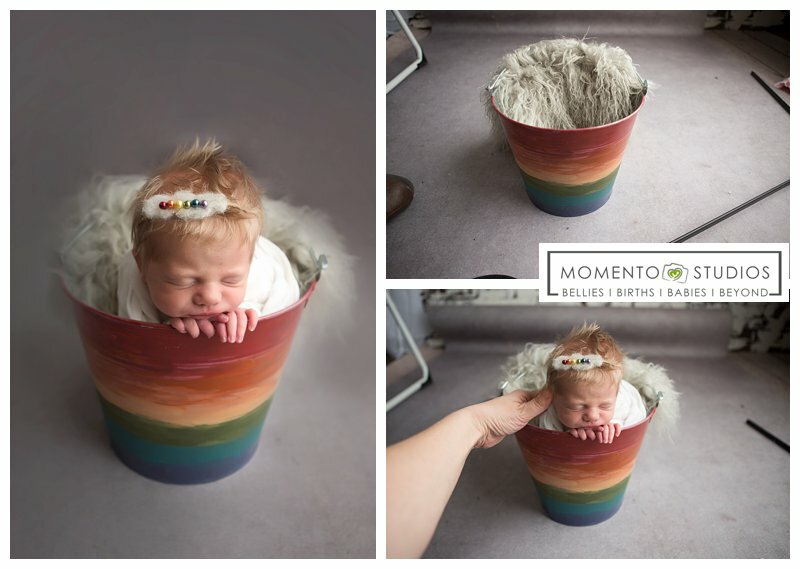 Newborn photography is not new, but with the prominence of digital photography, there are now very few barriers to entry. Just about anyone can pick up a camera, put together a Facebook page, and call themselves a “newborn photographer” these days. This is not necessarily a bad thing, as everyone has to start somewhere. However, many of these photographers are not operating legal businesses, nor are they paying taxes. They do not have business insurance to protect your family in the event that your newborn is injured in their care or becomes ill following your newborn photo session. 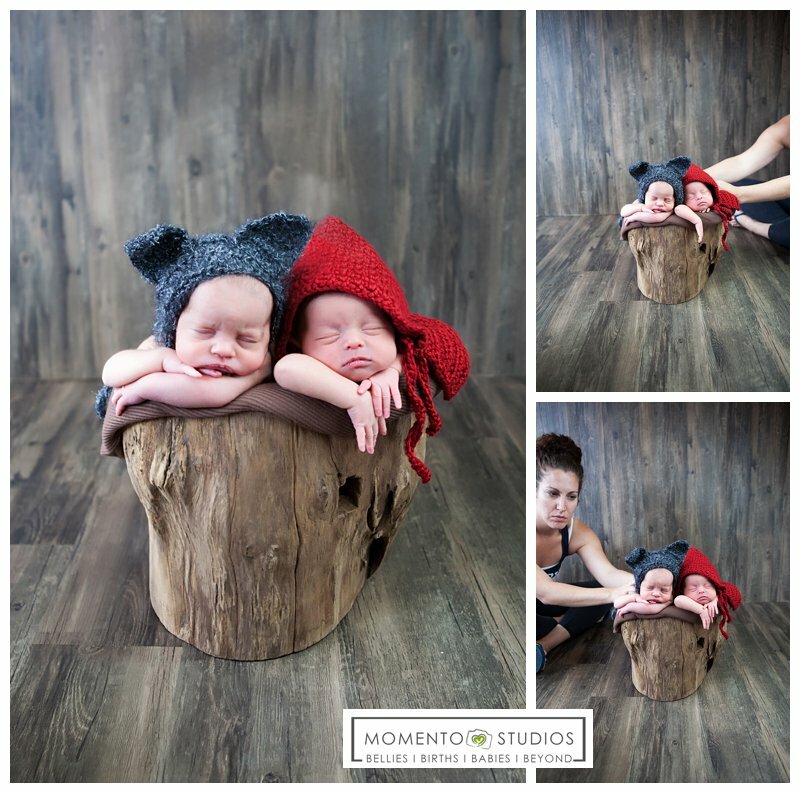 They have not invested in specific newborn photography safety and posing education, certifications, and do not have the years of experience that skilled professionals have accumulated. It is the combination of these factors that can be a recipe for disaster: not only in the quality of the finished portraits, but also in the experience and safety for your baby. Think about this: when you look for a hair stylist, do you choose the least expensive option (the gal that is “pretty good” at cutting hair, but has only gained experience from YouTube tutorials and is offering “portfolio building discounts?) Or do you select the artist that has been professionally trained, has years of experience and either went to beauty school or has her beautician’s license? 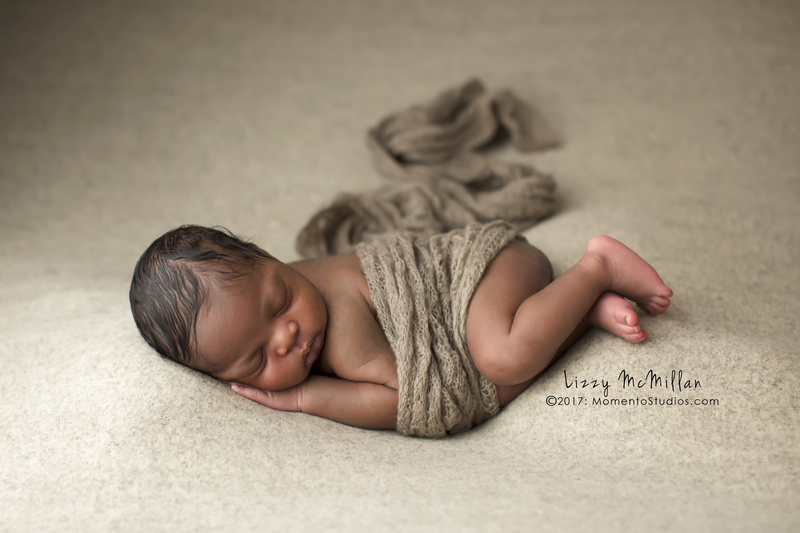 You are your baby’s advocate- so how do you select a qualified newborn photographer? HOW can you differentiate a true professional that is qualified, accredited, has experience in safety, proper posing, and is capable of creating beautiful portraits for your family? You want the best for your baby and understandably, budget is an important component. 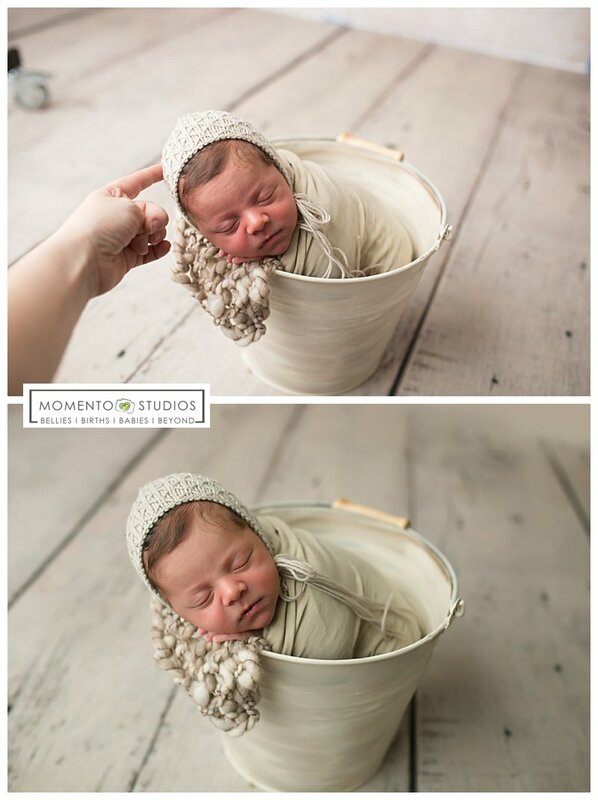 This is why Momento Studios offers a “Newborn Only Petite Session”- so you can still have beautiful images of your newborn captured by a safe, experienced professional. While you might think that finding a newborn photographer in Arizona that fits your budget is the most important deciding factor, the hard truth is: finding an experienced photographer that places an emphasis on your infant’s safety is the most important detail you can look at. Unfortunately, newborn photography safety is not currently a regulated industry- so this process can be difficult if you do not know what to look for or ask your photographer. Lizzy has been recognized for her passion for newborn photography safety, and continuing education. As such, she has been asked to be an Ambassador for two of the most prominent newborn photography safety and education resources: Stand In Baby and Accredited Professional Newborn Photographers International. Lizzy is an official Ambassador for Stand In Baby, and utilizes the SIB posing doll in her newborn photography workshops around the world to promote newborn photography safety, proper posing and education for other photographers. Additionally, she is a Qualified Newborn Photographer (QNP) and official Ambassador for Accredited Professional Newborn Photographers International (APNPI). The QNP Certification aims to recognize the competence and professional standard for newborn photographers. It is the leading quality assurance certification for newborn photographers around the world. 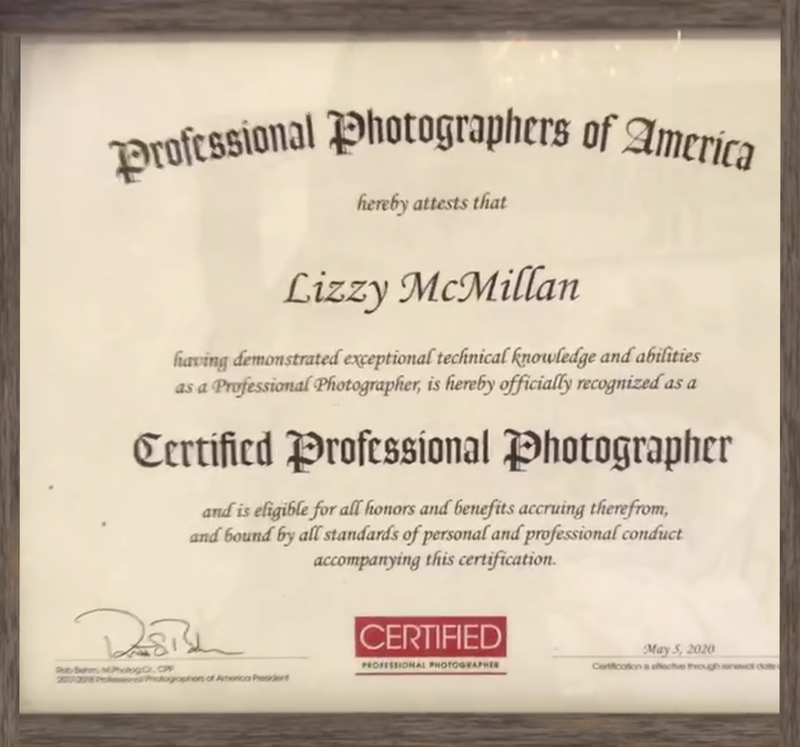 Lizzy McMillan is the only PPA Certified Professional Photographer (CPP) in Arizona that specializes in maternity and newborn photography. So what is a “CPP” and why is that important when looking for a professional photographer? According to the accrediting body, Professional Photographers of America, “These days, photography is practiced by anyone with a smartphone, but it’s mastered by few. When it comes to those once-in-a-lifetime moments—when you’ve got one shot at getting it right—you better make sure the person behind the camera is a pro. A proven professional photographer that is. There’s no greater proof than when the letters “CPP” follow a photographer’s name. They designate a Certified Professional Photographer, someone who is putting in the extra work to stay above the rest. It assures you of this photographer’s professional knowledge and experience, while also declaring that photographer as one who has achieved and maintains a higher standard.” (quoted here from the PPA website). APNPI is a great resource for parents with questions about newborn photography safety, and has created this list of questions below to help you properly evaluate your Arizona newborn photographer options. You can view Lizzy and Momento Studios responses to the questions on our FAQ page. 3. 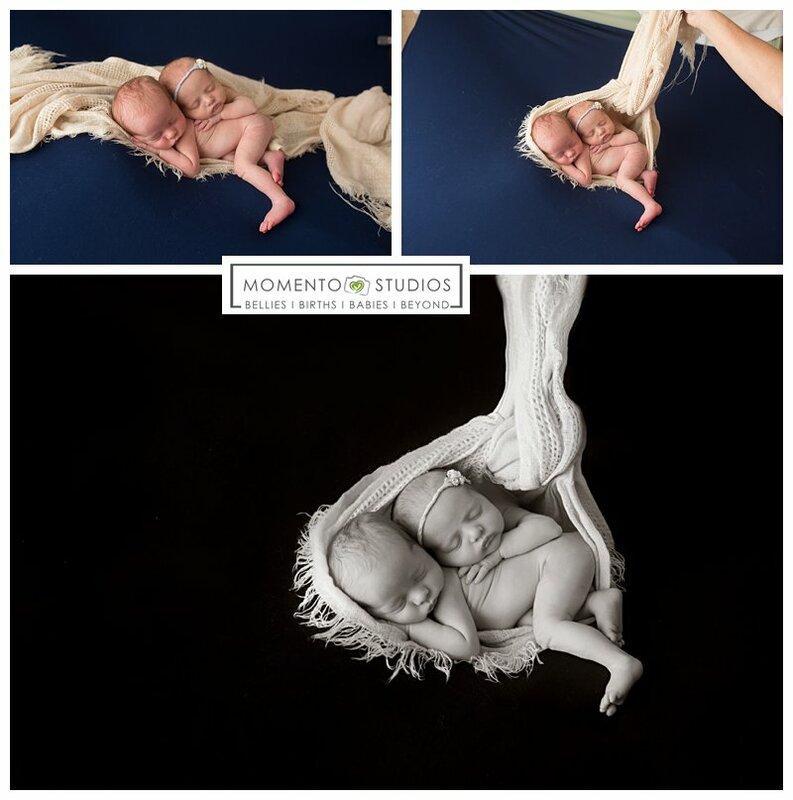 What are the safety practices you have in place in your studio specifically geared towards the newborn client? 4. Will my newborn be supported by human hands in all upright positions as well as any poses requiring suspension? 5. 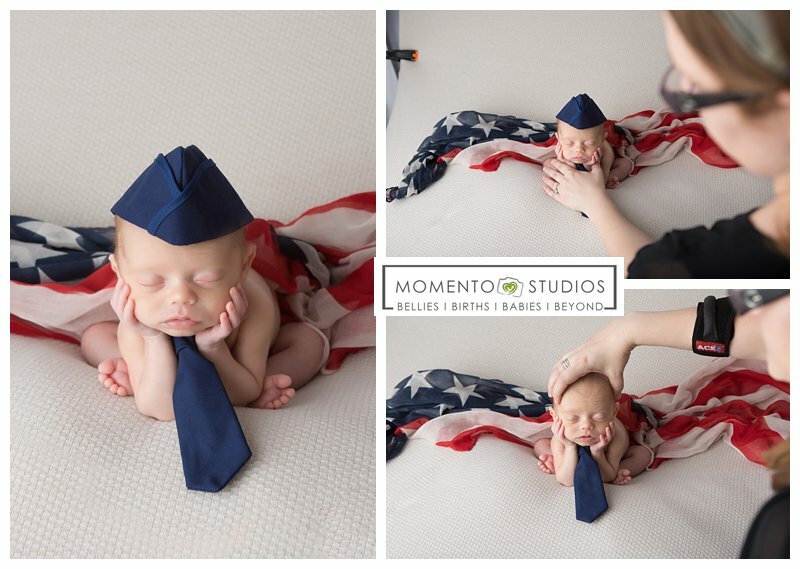 Do you work with an assistant or provide spotters at your newborn sessions? If not, will you allow me to spot my baby during a session? 6. What will happen in the case of illness, your own or otherwise? 7. Are you currently up to date on the necessary vaccines needed when working with a pregnant or newborn population? 8. Can you point me towards online resources from which I can learn about safe practices when photographing newborns? 9. Are you a member of an organization or association directly servicing newborn photographers and their educational needs? Feel free to download your copy of these questions from APNPI here. These first two images show the straight out of camera images, as well as the final edit. This “peeking bucket” pose has become very popular recently, but can be dangerous if not posed and photographed correctly. Newborns are not capable of supporting the full weight of their own head in this upright position, regardless of how well they are wrapped. Positional asphyxiation is a danger that you may not be aware of. To ensure the peeking bucket poses, as well as the popular “potato sack” pose are captured safely, a hand should be kept on baby at all times. Additionally, it is important to use a weight in the prop or bucket, to counterbalance the positioning of the baby’s weight. Both of these bucket images have a flat, 10 pound weight in the bottom. This is know as the “froggy pose” and should always be created as a composite of two images. Supporting the baby’s head at all times is imperative with this pose. If you do not have a posing assistant, you can mom or dad to help. This “suspended stork” pose is an optical illusion, as these twins are safely laying on the posing bean bag at all times. First, the babies are posed on top of the scarf, with one leg positioned like it is dangling. Second, the scarf is loosely tied around the babies, and the assistant holds the scarf taut. The twins are never lifted or suspended off of the posing bean bag. When working with twins, it is important to enlist a second set of hands for safety. Working with two babies means working with two startle reflexes. In this image below, the assistant keeps her hands on the back of both babies’ heads at all times. Both twins have full support, so their heads are both secure and there is no risk of injury if they startle. The edge of the prop is lined with soft padding to support them, and protect their delicate skin. The images are combined together in photoshop, and the assistant is edited out. *Note: poses like this in a prop with a single baby can be achieved without an assistant’s hand on the baby at all times. However, the photographer and/or an assistant should keep their eyes on the baby at all times, and be within arm’s reach in the event that baby startles. 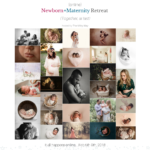 Photographers: if you are interested in learning more about newborn photography safety, newborn workshops or mentoring with Lizzy, please click here.